The unit contains a shower-type brewer and a removable 1-1/2-liter water tank with handle for easy filling. For those in a hurry, its drip-stop function allows for pouring a cup of coffee before the end of the brewing cycle. The machine includes a high-quality carafe with a stainless-steel lid and a beautiful silver spray handle for graceful serving. Other highlights include a chrome button on/off switch, a blue LED light indicator, simple-to-read measuring marks, a 1-by-4-size removable V-shape filter, and a grey PVC power cord. Its polished stainless-steel finish and screwed-on frosted-glass decorative plates make for a stunning addition to any kitchen counter. 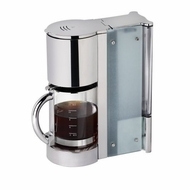 The coffeemaker measures 11 by 5-1/2 by 14 inches and carries a one-year warranty.